Tucked into the woods on a back road, with a babbling brook running alongside it, this house offers seclusion, serenity, and a respite from everyday life. But while it may be rustic, it's also a proper house, and a stylish one at that -- the kind of mountain chalet Don Draper would have used to escape the pressures of Madison Avenue. Built in the 1960s, its architectural flair is still apparent, even as it's been updated with new furnishings and amenities. This is not a cabin but a true vacation house, built for year-round use. Rising through the center, a roaring fireplace faces the open-plan main floor. The living room has a large L-shaped couch and two very comfy armchairs. Beyond that is a table and club chairs for card games, framed by towering windows that rise two floors up to the vaulted ceiling and overlook the forest and the brook -- a beautiful view and a source of ample natural light. The dining table expands to seat ten and also has an expansive view of the surrounding woods. The adjoining kitchen boasts modern fixtures, a full-size fridge, two ovens, a range and a microwave, making it a very functional cooking space. All the cookware you'll need to prepare a feast is here for you -- there's even a fondue set. On this floor you'll also find a full bathroom and a bedroom with two twin beds. Cable TV, a DVD player, a stereo system with surround-sound speakers, wireless internet and firewood are all included. A floating staircase leads to the upper floor, where you'll find two bedrooms, each with a queen-size bed. One of these bedrooms has its own private deck with a soaring view of the forest. There are two full bathrooms, one with a shower and skylight, the other with an extra-deep soaking tub -- the perfect place to lounge after a long day of hiking or skiing. The lower floor was added in the 1980s, and they actually lifted the entire house to build it, so it's not a finished basement but an actual floor of the house with windows that overlook the brook. This is a great place for the kids to play -- it's fully carpeted, has cable TV, DVD, and a washer and dryer. There are two bedrooms on this floor, one with a set of twin beds, the other with a super-comfy queen. In all of these bedrooms, you'll sleep like a baby. The house is located on a seldom-used street, and nights up here are silent and dark, save for the crickets and the dazzling display of stars. If you're visiting from the city, you'll be amazed at the wonders this does for your slumber. Our family built this house, and we've taken extremely good care of it. All appliances and fixtures are in excellent condition, and it's impeccably maintained. Should you have any issues during your stay, its owners live nearby. 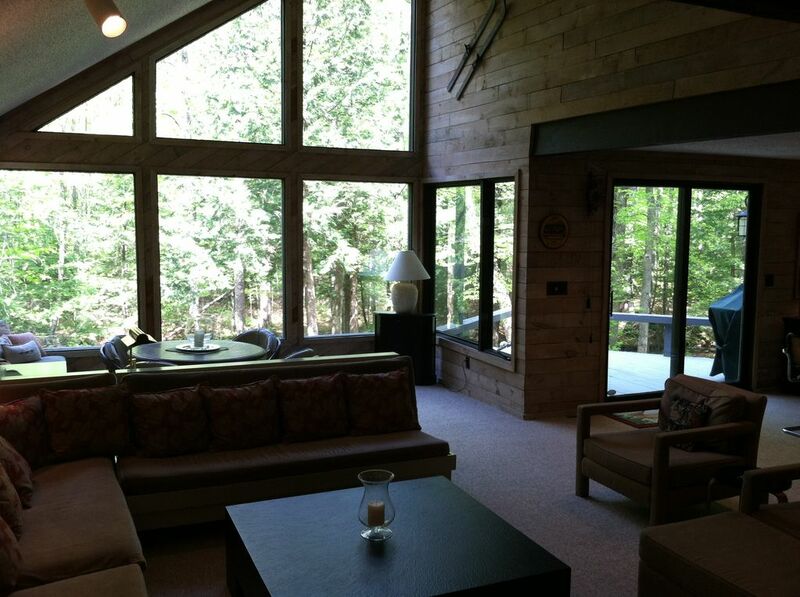 It's a fabulous space that offers a rustic mountain getaway with all the conveniences you could ask for. For the past half century, this house has been shared and cared for by our extended family. We're from Massachusetts and would drive up every weekend, all winter long, to stay here and ski together: brothers, sisters, cousins, aunts, uncles, mothers, fathers and grandparents. In 1961, when my grandparents built this place, skiing was still considered a fairly eccentric activity to devote so much time to, but we're very glad they did. Today, it sits in the midst of the region's best ski resorts, as well as a range of spectacular hiking, camping and swimming spots. It's hard to choose one thing about this house that makes it so unique -- the expansive views of its gorgeous surroundings, of course, and its classic modern design. And it's location is unbeatable, set in such a secluded environment yet only a short walk or drive from town and so many outdoor activities. Deck and living room overlook a babbling brook in the woods. We have a few DVDs, and many more can be rented in town from Redbox vending machines that don't require a membership. The house was perfect for all the people we had with us. We loved the view of the stream. The open space inside the house was a great place for the kids to play. They loved sitting around the table overlooking the stream. The kitchen gave plenty of room for us to adults to gather and do everything we needed to do. The bedrooms were spaces. The whole house was very clean. The house was close to everything we needed. It was easy to get around with help from all the back roads around the seasonal traffic. thank you for allowing us the pleasure of renting this great house and a wonderful location. We had a great stay here with 5 adults and 4 children (ages 4-8). It is large enough to easily accommodate a group this size. The house is very close to the Main Street of North Conway, Storyland and the Kahuna Laguna waterpark but feels very secluded due to it’s position in the forest. The house is well equipped, with a good sized kitchen and dining area, with enough bathrooms and showers for everyone to use comfortably. There is no air conditioning, so it did get rather hot overnight, but that did not bother us. The owner responded promptly to enquiries about our weekend rental and the information pack provided made everything very straightforward. If you are planning a family trip to North Conway this is an excellent place to base yourselves. Beautiful wooded setting overlooking a winding brook - which was nice background music in the evening. The large house is located close enough to Main Street in North Conway for a stroll. And most stores are a short ride. Our family of six adults and two infants fit comfortably so everyone had "space". The room set-up worked perfectly for the babies to sleep within ear shot of parents. We do a lot of hiking and the house was convenient to the mountains and other outdoor attractions. There are even several challenging hikes with beautiful views a short walk from the house. Everyone loved the place and we would stay again. The owner was easy to work with. Great spot for large families - right in town! We picked this spot because of its size and proximity to town. It was plenty of space for our family of 5 and would have accommodated a group two or three times that size easily. We loved the brook out back and the peaceful setting. This home was so perfect for our family trip to North Conway. The home is beyond beautiful and we couldn't stop saying all weekend how great it was. The location couldn't be better with downtown North Conway down the street. The deck overlooked a beautiful wooded backyard with a stream that was picture perfect. If you want to cook for a crowd there was a double oven and a stove and a table big enough for everyone. We took the downstairs bedroom and had a nice large bath and our own family room which gave us privacy. There were so many other bedrooms that everyone felt they had that same privacy. The open floor plan in the first floor was so large that it is a wonderful gathering place. I would highly recommend this home for anyone looking for a spectacular place to stay in wonderful North Conway. We have stayed in North Conway many times but this was by far the best place we have ever stayed. Our family of five, my wife and I and our three adult children, had a great time at this lovely home. The setting was beautiful and quiet with a great brook running by the house. The house was very comfortable and well set up for a vacation. We made big family dinners together and the kitchen was well set up for cooking together. The house was in an excellent location for hiking and we especially liked the spacious "mud room" where we could put our gear after returning from hikes. We sat around the big fireplace at the end of the day and it was a great setting for quality family time. The beds were very comfortable, which was appreciated after a long active day. The house was in a beautiful setting but close to North Conway for restaurants and shopping. We plan to come back! This was a great vacation. The White Mountain National Forest is the most breathtakingly scenic part of New Hampshire, and North Conway is without a doubt the best jumping-off point to experience its excellent hiking, skiing, swimming, and other outdoor activities. The charming town center runs along a main street lined with restaurants, bars, and shops, past a historic railroad depot that still services the Conway Scenic Railway, which you can ride deep into the mountain passes. The granite cliffs of Cathedral and White Horse ledges can be seen to the west, and Mt. Washington, the tallest mountain on the East Coast, provides a dramatic and towering backdrop to it all. The stunning natural beauty that surrounds this area is truly without equal in northern New England. In winter, hit the slopes at one of the area's many ski resorts, good for all ability levels. During summer, plunge into Diana's Baths, a secluded series of cascades and crystalline swimming holes, or go tubing or kayaking down the Saco River. Hike the Presidential Range -- from the highest peaks you can see all the way to New York's Adirondack mountains to the west and the shimmering Atlantic coast to the east. Visit in the fall to experience the region's famous, unrivaled display of foliage. Virtually every outdoor activity is at your doorstep: camping, fishing, birdwatching, golf, tennis, show-shoeing -- you name it. North Conway also has the widest selection of shopping and eating options in the region: everything from antique shops to general stores to brand-name outlets. Sales tax? Not here in New Hampshire! It's hard to imagine a more scenically beautiful, conveniently located spot than North Conway. The easy-going historic town center is just about a mile from the rental house -- close enough that you could walk there in minutes, but far enough away that you'd never even know it was there while you're lounging on the back deck overlooking the forest and babbling brook. Best of both worlds.